The Standard Geographical Classification (SGC) 2016 is the current departmental standard and was approved on May 16, 2016. The Standard Geographical Classification (SGC) is Statistics Canada's official classification for geographic areas in Canada. The SGC covers all of the provinces and territories of Canada. The standard classification version of the SGC 2016 provides names and codes for the geographical regions of Canada, provinces and territories, census divisions (counties, regional municipalities) and census subdivisions (municipalities). The names and codes for census metropolitan areas, census agglomerations, census metropolitan influenced zones, economic regions, census agricultural regions and census consolidated subdivisions are shown as the variants of SGC 2016. The SGC was developed to enable the production of integrated statistics by geographic area. It provides a range of geographic units that are convenient for data collection and compilation, and useful for spatial analysis of economic and social statistics. It is intended primarily for the classification of statistical units, such as establishments or households, whose activities are normally associated with a specific location. The classification consists of two parts, volume I and volume II. Volume I describes the classification and related standard geographic areas and place names. The Introduction explains the changes between the 2016 version of the SGC and the 2011 version that impact upon the classification, such as changes in name, type or code, and indicates how the new and old codes relate to one another. Volume II contains reference maps showing the boundaries and locations of the geographic areas in the classification. Concordances between the 2016 classification and the 2011 classification as well as annual changes in the census subdivision names, types and codes are also available. This update of the Standard Geographical Classification (SGC) was accomplished through the time, effort and co-operation of numerous people in Statistics Canada. SGC 2016 was updated by Standards Division. SGC 2016 could not have been updated without the significant contribution of Statistical Registers and Geography Division (SRGD) and Agriculture Division, as well as the support of System Engineering Division and the Administrative and Dissemination Systems Division. Their efforts are gratefully acknowledged. This version of the SGC includes a classification variant that describes the agricultural geography of Canada. 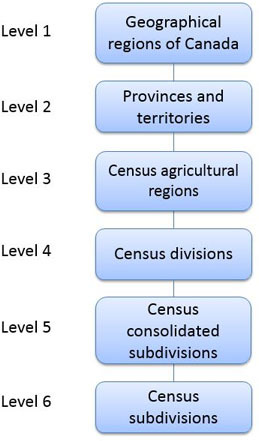 This classification variant includes geographical regions of Canada, provinces and territories, census agricultural regions, census divisions, census consolidated subdivisions and census subdivisions. The SGC enables the production of integrated statistics by geographic area. Established in the early 1960s, the Standard Geographical Classification was released as a working manual for 1964, 1966 and 1972. In 1974, the manual became an official publication of Statistics Canada and was subsequently issued for 1976, 1981, 1986, 1991, 1996, 2001, 2006 and 2011. This 2016 version is the tenth edition. The SGC conforms to the basic principles of classification. It consists of a set of discrete units that are mutually exclusive and, in total, cover the entire universe. Usually, a classification appears as a hierarchy, each level of which satisfies the above-mentioned principles and is defined by the uniform application of a single criterion. Applied to geography, these principles result in a classification consisting of geographic areas whose boundaries are specifically delimited in accordance with well-defined concepts and which, in total, cover the entire landmass of Canada. The classification appears as a four-level hierarchy of geographic units identified by a seven-digit numerical coding system. The SGC is one of a family of geographical classifications, approved and promoted by Statistics Canada. These geographical classifications provide the basic definitions of geographic areas which, when adopted for data collection and dissemination, result in statistics that are comparable among series and over time. Two criteria were used in the selection of geographic units for the SGC. The first was that they be easily recognized by the respondents who are asked to report geographical detail. Administrative units were chosen because respondents routinely conduct business with administrative units such as a municipality, county or province. The second criterion was the usefulness of the geographic units for general statistical purposes. Once again, administrative units were suitable because they are used by those establishing and implementing programs involving the expenditure of public funds and also because the general public can readily associate statistics on this basis with the names and boundaries of administrative units. Geographic units range from the more detailed census subdivisions to the geographical regions of Canada. 'Census subdivision' is the general term for municipalities as determined by provincial or territorial legislation, or areas treated as municipal equivalents for statistical purposes. Municipalities are units of local government. The geographical regions of Canada are groupings of provinces and territories. The range of geographic units in this hierarchical classification allows for the publication of data at different levels of aggregation. In SGC 2016, there are 6 geographical regions of Canada, 10 provinces and 3 territories, 293 census divisions and 5,162 census subdivisions. 'Province' and 'territory' refer to the major political units of Canada. From a statistical point of view, province and territory are basic areas for which data are tabulated. Canada is divided into 10 provinces and 3 territories. Census division (CD) is the general term for provincially legislated areas (such as county, municipalité régionale de comté and regional district) or their equivalents. Census divisions are intermediate geographic areas between the province/territory level and the municipality (census subdivision). Usually they are groups of neighbouring municipalities joined together for the purposes of regional planning and managing common services (such as police or ambulance services). These groupings are established under laws in effect in certain provinces of Canada. For example, a census division might correspond to a county, une municipalité régionale de comté or a regional district. In Newfoundland and Labrador, Manitoba, Saskatchewan, Alberta, Yukon, Northwest Territories and Nunavut, provincial or territorial law does not provide for these administrative geographic areas. Therefore, Statistics Canada, in cooperation with these provinces and territories, has created equivalent areas called census divisions for the purpose of collecting and disseminating statistical data. In Yukon, the census division is equivalent to the entire territory. Census division boundaries tend to be relatively stable over many years. For this reason, the census division has been found useful for analyzing historical data. Census divisions are classified into 12 types. Ten of these types were created according to official designations adopted by provincial or territorial authorities. The other two types - 'census division / division de recensement' (CDR) and 'territory / territoire' (TER) - were created as equivalents by Statistics Canada, in cooperation with the affected provinces and the territory, for the purpose of collecting and disseminating statistical data. It should be noted that some census divisions in different provinces or territories have both the same name and type (e.g., the counties of Kings in Prince Edward Island and Nova Scotia). These census divisions are distinguished from each other by using the four-digit census division unique identifier (the two-digit province and territory code with the two-digit census division code). All census divisions in Canada have a unique code in the Standard Geographical Classification. Table A shows CD types, their abbreviated forms, and their distribution by province and territory. Census subdivision (CSD) is the general term for municipalities (as determined by provincial/territorial legislation) or areas treated as municipal equivalents for statistical purposes (e.g., Indian reserves, Indian settlements and unorganized territories). Municipalities are units of local government. There are two municipalities in Canada that straddle provincial boundaries: Flin Flon (Manitoba and Saskatchewan) and Lloydminster (Saskatchewan and Alberta). Each of their provincial parts is treated as a separate CSD. Three Indian reserves also straddle provincial limits: Shoal Lake (Part) 39A and Shoal Lake (Part) 40 (Ontario and Manitoba); and Makaoo (Part) 120 (Saskatchewan and Alberta). All of these parts are treated as separate CSDs. Beginning with the 1981 Census, each Indian reserve and Indian settlement recognized by the Census is treated as a separate CSD and reported separately. Prior to the 1981 Census, all Indian reserves in a census division were grouped together and reported as one census subdivision. For 2016, there are a total of 949 Indian reserves and 27 Indian settlements classified as CSDs. These are populated (or potentially populated) Indian reserves, which represent a subset of the approximately 3,200 Indian reserves across Canada. Statistics Canada works closely with Indigenous and Northern Affairs Canada (INAC; formerly Aboriginal Affairs and Northern Development Canada [AANDC]) to identify the reserves and the settlements to be included as CSDs. Furthermore, the inclusion of an Indian settlement is dependent upon the agreement of the provincial or territorial authorities. Census subdivisions are classified into 53 types. Fifty-one of these were created according to official designations adopted by provincial, territorial or federal authorities. The other two types - 'subdivision of unorganized' in Newfoundland and Labrador, and 'subdivision of county municipality' in Nova Scotia - were created as equivalents to municipalities by Statistics Canada, in cooperation with the two affected provinces, for the purpose of collecting and disseminating statistical data. It should be noted that some CSDs, in the same province or territory, have the same name but different CSD types. In these cases, the census subdivision type accompanying the census subdivision name is used to distinguish CSDs from each other (e.g., Moncton, C [for the city of Moncton] and Moncton, P [for the parish of Moncton]) within that province or territory. Similarly, a small number of CSDs in different provinces or territories have both the same name and type (e.g., the towns of Cochrane in Ontario and Alberta). These CSDs are distinguished from each other by using the seven-digit SGC code. All CSDs in Canada have a unique code in the Standard Geographical Classification. Table B shows CSD types, their abbreviated forms, and their distribution by province and territory. Each of the four levels of the classification covers all of Canada. They are hierarchically related: census subdivisions aggregate to census divisions, census divisions aggregate to a province or a territory which in turn aggregate to a geographical region of Canada. The relationship is illustrated in Figure 1. This structure is implicit in the seven-digit SGC code as shown in the following illustration for the city of Oshawa. The region code is the first digit of the province and territory code. The code for the city of Oshawa is 3518013. At the outset, numerical codes were adopted for ease of use and clarity. The numbers were universally applicable to all of the data processing machines in use at that time. The use of numerical codes continues but the number of digits in the code changed from six to seven in 1976, when a three-digit code was adopted for census subdivisions because the number of census subdivisions in one census division exceeded 99. Provinces are numbered from east to west. Because the number of provinces and territories exceeded nine, a two-digit code was adopted. The first digit represents the geographical region of Canada in which the province or territory is located and the second digit denotes one of the 10 provinces and 3 territories. 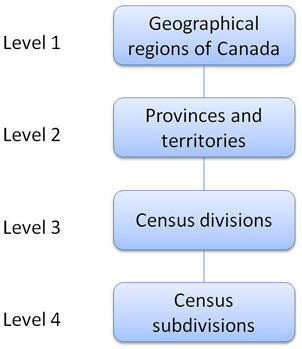 The codes for geographical regions of Canada are shown in Table C.
The provincial and territorial codes are shown in Table D.
The codes usually follow a serpentine pattern beginning in the southeast corner of each province, territory or census division. In this way, adjacent code numbers usually represent geographic units that share a common boundary. Exceptions are found in Saskatchewan and Alberta, where census divisions are numbered in a straight line from east to west, returning to the eastern border when the western border is reached. Also, in Quebec, Saskatchewan, Alberta, and British Columbia, Indian reserve codes are included in the 800 series of numbers, whereas in the other provinces they are accommodated within the serpentine numbering pattern for census subdivisions. In order to provide the flexibility required to maintain the coding system over the years, the numbering is not sequential (except for census divisions, which are more stable). Gaps in the numbering sequence leave opportunities to incorporate new geographic units within the numbering sequence. Codes are not generally used more than once. However, a code may be reused if at least two editions of the classification have been published since it was last used. For example, a code deleted in 2001 may be reused in 2016. Component parts of codes are preserved as much as possible. For example, when a new CD is created, the original CSD codes are retained where possible. Most official names are accepted as published, but many are edited by Statistics Canada for the sake of consistency and clarity. For example, Statistics Canada drops the CSD type and uses the geographical name only (i.e., the official name City of Ottawa appears in the SGC as Ottawa). Six municipalities (i.e., census subdivisions) in Canada have different official names in English and French: Beaubassin East / Beaubassin-est, and Grand Falls / Grand-Sault in New Brunswick; and Greater Sudbury / Grand Sudbury, French River / Rivière des Français, The Nation / La Nation, and West Nipissing / Nipissing Ouest in Ontario. For English products, the official name in English is used (i.e., Greater Sudbury), for French products, the official name in French is used (i.e., Grand Sudbury), and for bilingual products, the bilingual name is used with English followed by French (i.e., Greater Sudbury / Grand Sudbury). CMA names can consist of up to three legislated municipal names of eligible CSDs that are components of the CMA. However, the number of name elements in any new CMA name request is limited to five. If any of the eligible CSD names are already hyphenated or compound, the number of CSD names will be limited to two or one if the number of name elements exceeds five. The eligible municipal names include the historic central municipality name and the two component CSDs with the largest population, and having a population of at least 10,000, according to the last census. The ordering of the municipal names within the CMA name is determined by the historic (central) municipality and the population size of the eligible CSDs. The first component of the CMA name is always the historic (central) CSD even if its census population count is less than the other eligible component CSDs. This ensures that CMA names retain a measure of stability for better longitudinal recognition. The second and third place name order is determined by population size. The component CSD with the higher census population count at the time of the name change assumes the second position and the next largest component CSD the third position. In order for a requested CMA name change to be implemented, there must be explicit consensus among all eligible component municipalities on a proposed new name and a formal request, in accordance with these guidelines, must be sent to the Director of the Statistical Registers and Geography Division at Statistics Canada by June 1 of the year prior to the census. The CMA name change will be implemented in the revision of the Standard Geographical Classification related to the census under consideration. Statistics Canada will continue to change CMA names whenever the legislated name of a municipality changes. Any other request for a name change will only be considered within the context of these guidelines. The remaining sub-provincial geographical names are created by Statistics Canada in cooperation with provincial, territorial and federal officials (e.g., when creating names for most economic regions). Some statistical areas (e.g., census metropolitan areas and census agglomerations) straddle provincial boundaries (e.g., the census metropolitan area [CMA] of Ottawa–Gatineau). In such a case, when data are presented for the provincial parts, the name of the province must follow the name of the statistical area. For the CMA of Ottawa–Gatineau, each part of the CMA will be identified as Ottawa–Gatineau (Ontario part) and Ottawa–Gatineau (Quebec part). Where the CD or CSD type (e.g., county, town, city) is part of the legal name of the CD or CSD as legislated by provincial or territorial governments, Statistics Canada uses the language form of the legal name. In all other cases, where the CD or CSD type is not embedded in the legal name, Statistics Canada uses the language of the publication. As a consequence, this means that in an English language publication there may be some French language type names, and that in French language publications there may be some English language type names. For example, in the case of Bathurst, New Brunswick, the legislation specifies that the legal name is "City of Bathurst". Accordingly, the type is presented as City (CY) in English publications; City (CY) in French publications; and as City (CY) in bilingual publications. Due to system constraints, Statistics Canada is unable to maintain certain characters within geographic names. This results in a difference between the official names and those used in census products. For example, the economic region with the official name 'Campbellton–Miramichi' will be published as 'Campbellton--Miramichi'. Table E and Table F provide the standard abbreviations and titles for all CD and CSD types for English, French and bilingual publications respectively. The SGC 2016 presents standard geographic areas as of January 1, 2016. It includes any changes to municipalities, effective on that date or earlier, received by Statistics Canada before the spring of 2016. Information received after the spring of 2016, has not been included, therefore provincial or territorial authorities may notice some small discrepancies compared to their official records. Several hundred changes are made to census subdivisions every five years. These changes may affect boundaries, codes, names, or types. 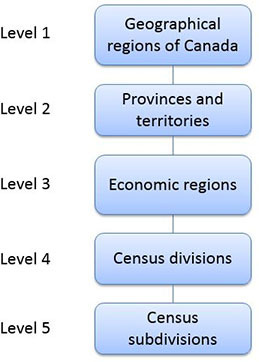 Changes to the census division level also occur periodically. Most changes originate from provincial legislation (revised statutes and special acts), changes to Indian reserves originate with Indigenous and Northern Affairs Canada, and other changes come from Statistics Canada. Legislated changes are effective as of the date proclaimed in the legislation. Other changes are effective January 1, usually of the reference year for the SGC. The Standard Geographical Classification is published every five years, coincident with the Census of Population. For most statistical applications, holding the geography in a statistical series constant for this length of time is an acceptable compromise between stability and existing reality. Observations at five-year intervals are suitable for historical trend analysis, yet for current series, a tolerable degree of distortion occurs. The SGC 2016 presents a summary of the changes affecting the SGC between January 2, 2011 and January 1, 2016. Volume I of the SGC 2016 contains three concordance tables for that period on the changes that impact directly upon the SGC, such as changes in code, name, or type and indicates how the new and old codes relate to one another. In addition, a fourth table provides 2011 Census population counts based on the census subdivision boundaries of each January and July 1st for census subdivisions affected by a boundary change during the period 2011 to 2016. In New Brunswick, the boundary between Gloucester (CD 13 15) and Northumberland (CD 13 09) was adjusted because Saumarez, P (CSD 13 15 001) and Tracadie-Sheila, TV (CSD 13 15 003) were amalgamated and parts of Saint-Isidore, P (CSD 13 15 021), Alnwick, P (CSD 13 09 036) and Inkerman, P (CSD 13 15 024) were annexed to form the incorporated municipality of Tracadie, RGM (CSD 13 15 002). In Manitoba, there were three changes that affected census division boundaries. The boundary between Division No. 6 (CD 46 06) and Division No. 8 (CD 46 08) was adjusted because Notre Dame de Lourdes, VL (CSD 46 08 033), Somerset, VL (CSD 46 04 066) and Lorne, RM (CSD 46 04 063) were amalgamated to form Lorne, MU (CSD 46 04 064). In addition, the boundary between Division No. 7 (CD 46 07) and Division No. 15 (CD 46 15) was adjusted because Langford, RM (CSD 46 15 018) and North Cypress, RM (CSD 46 07 065) were amalgamated to form North Cypress-Langford, MU (CSD 46 07 066). Finally, the boundary between Division No. 2 (CD 46 02) and Division No. 3 (CD 46 03) was adjusted because Franklin, RM (CSD 46 02 025) and Emerson, T (CSD 46 03 033) were amalgamated to form Emerson-Franklin, MU (CSD 46 02 024). The changes affecting CSDs are grouped into eighteen types, each represented by a particular code. They are listed in Table G below with an indication of each type's impact upon the SGC code. A legend is provided to explain the appropriate codes (codes 1, 2, 2C, 23, 3, 3C, 4, 5A, 6, 7 and 7C) used in the concordance tables. A more detailed explanation follows. created when two or more census subdivisions amalgamate. In the latter case, the entries, including SGC codes, for all of the census subdivisions contributing to the newly created census subdivision are deleted (code 4). Also affecting the SGC code are revisions arising from structural changes, such as the reorganization of CDs. This type of change (codes 7 and 7C) simply indicates a revised code number, with no other change having affected the CSD. Changes in CSD name (codes 2 and 2C), CSD type (codes 3 and 3C), or CSD name and type (code 23) do not affect the SGC code, but the classification file is updated. The most numerous changes are partial annexations (codes 5 and 6) and boundary revisions (codes 8, 8C, 9 and 9C), which do not affect the SGC codes, and usually involve very small areas. These changes are not listed in the concordance tables, but they can be found in the publication entitled Interim List of Changes to Municipal Boundaries, Status, and Names. Since January 2, 2011, a total of 1,024 CSD changes have been recorded. These changes affected approximately 800 of the 5,253 CSDs that existed in 2011, and resulted in a net reduction of 91 CSDs over the period. Of the total number of changes, 233 affected the CSD code (161 dissolutions, 70 incorporations and 2 revisions of code), 28 affected the name, 65 affected the status and 7 affected both the name and status. Boundary changes and revisions (585) and population revisions (106) accounted for the remaining 691 changes. Since 2011, CSD boundary changes in New Brunswick and Manitoba affected 4 census divisions. Table H presents the number of census subdivision changes by type and by province and territory. This classification variant includes entire census metropolitan areas (CMAs), census agglomerations (CAs) and the census metropolitan influenced zones (MIZs) within Canada. This classification variant includes provinces and territories, census metropolitan areas (CMAs), census agglomerations (CAs) and the census metropolitan influenced zones (MIZs). It presents the provincial and territorial parts of CMAs, CAs and MIZs that cross provincial or territorial boundaries. This classification shows the economic regions of Canada. This classification variant includes the geographical regions of Canada, provinces and territories, census agricultural regions, census divisions, census consolidated subdivisions and census subdivisions of Canada. Each classification variant of the SGC is a set of customized groupings that use SGC's census subdivisions as building blocks. In Statistics Canada, variants are created and adopted in cases where the version of the classification does not fully meet specific user needs for disseminating data or for sampling in surveys. A classification variant is based on a classification version such as SGC 2016. In a variant, the categories of the classification version are split, aggregated or regrouped to provide additions or alternatives (e.g., context-specific additions) to the standard structure of the base version. The SAC provides unique numeric identification (codes) for these hierarchically related geographic areas. It was established for the purpose of reporting statistics. The hierarchical relationship of the geographic areas is shown in Figure 2. A census metropolitan area (CMA) or a census agglomeration (CA) is formed by one or more adjacent municipalities centred on a population centre (known as the core). A CMA must have a total population of at least 100,000 of which 50,000 or more must live in the core, based on adjusted data from the previous census. A CA must have a core population of at least 10,000, also based on data from the previous census. To be included in the CMA or CA, other adjacent municipalities must have a high degree of integration with the core, as measured by commuting flows derived from data on place of work from the previous census. If the population of the core of a CA falls below 10,000, the CA is retired from the next census. However, once an area becomes a CMA, it is retained as a CMA even if its total population falls below 100,000 or the population of its core falls below 50,000. All areas inside the CMA or CA that are not population centres are rural areas. When a CA has a core of at least 50,000, based on the previous Census of Population, it is subdivided into census tracts. Census tracts are maintained for the CA even if the population of the core subsequently falls below 50,000. All CMAs are subdivided into census tracts. A CMA or CA is delineated using adjacent municipalities (census subdivisions) as building blocks. These census subdivisions (CSDs) are included in the CMA or CA if they meet at least one of the following rules. The rules are ranked in order of priority. A CSD obeying the rules for two or more CMAs or CAs is included in the one for which it has the highest ranked rule. If the CSD meets rules that have the same rank, the decision is based on the population or the number of commuters (commuting flows) involved. A CMA or CA is delineated to ensure spatial contiguity. Delineation core rule: The CSD falls completely or partly (50% of its population) inside the core. Forward commuting flow rule: Given a minimum of 100 commuters, at least 50% of the employed labour force living in the CSD works in the delineation core, as determined by the previous rule. These numbers are established based on responses to the place of work question in the previous census. Reverse commuting flow rule: Given a minimum of 100 commuters, at least 50% of the employed labour force working in the CSD lives in the delineation core as determined from commuting data based on the place of work question in the previous census. Before 2016, the percentage was set at 25%. Spatial contiguity rule: CSDs that do not meet a commuting flow threshold may be included in a CMA or CA, and CSDs that do meet a commuting flow threshold may be excluded from a CMA or CA. Historical comparability rule: To maintain historical comparability for CMAs and larger CAs (those with census tracts in the previous census), CSDs are retained in the CMA or CA for at least one other census even if their commuting flow percentages fall below the commuting flow thresholds (rules 2, 3 and 4). By adjusting the historical comparability rule, users are warned that a CSD can be excluded from a CMA or from a larger CA in the next census or the next delineation thereof. Manual adjustments: A CMA or CA represents an area that is economically and socially integrated. However, there are certain limitations in the extent to which this ideal can be met. Since the CSDs that are used as building blocks in CMA and CA delineation are administrative units, their boundaries do not always match other statistical units (e.g., population centre cores). There are always situations where the application of the above rules creates undesirable outcomes, or where the rules cannot be easily applied. In these circumstances, a manual override is sometimes applied to ensure that the integrity of the program is retained. One of these situations is a core hole, which refers to a CSD located inside another CSD that is part of the core delineation rule, but at least 50% of its population is not within the same core and could not qualify according to any previous delineation rules. Therefore, this core hole must be included in the CMA or CA to maintain spatial contiguity. Another example of manual adjustment is when the CSD is partially inside the core and, based on data from the previous Census of Population, less than 50% of its population resides in the core. Furthermore, the CSD could not comply with the other previous delineation rules. Finally, the CSDs that consist of several parts or that contain holes also influence application of the manual adjustment rule. Merging adjacent CMAs and CAs: A CA adjacent to a CMA can be merged with the CMA if the total percentage commuting interchange between the CA and CMA is equal to at least 35% of the employed labour force living in the CA, based on place of work data from the previous census. The total percentage commuting interchange is the sum of the commuting flow in both directions between the CMA and the CA as a percentage of the labour force living in the CA (i.e., resident employed labour force, excluding the no fixed workplace address category). A CMA or CA represents an area that is economically and socially integrated. However, there are certain limitations to the manner in which this goal can be met. Since the CSDs, which are used as building blocks in CMA and CA delineation, are administrative units, their boundaries are not always the most suitable with respect to CMA and CA delineation. There are always situations where the application of rules creates undesirable outcomes, or where the rules cannot be easily applied. In these circumstances, a manual override is sometimes applied to ensure that the integrity of the program is retained. CMAs and CAs are statistically comparable because they are delineated in the same way across Canada. They differ from other types of areas, such as trading, marketing, or regional planning areas designated by regional authorities for planning and other purposes, and should be used with caution for non-statistical purposes. There are 35 CMAs and 117 CAs in 2016. Two new CMAs were created: Belleville (Ont.) and Lethbridge (Alta.). Eight new CAs were created: Gander (N.L. ), Sainte-Marie (Que. ), Arnprior (Ont. ), Carleton Place (Ont. ), Wasaga Beach (Ont. ), Winkler (Man. ), Weyburn (Sask.) and Nelson (B.C.). The CAs of Amos (Que.) and Temiskaming Shores (Ont.) were retired because the population of their cores dropped below 10,000 in 2011. The naming convention for CMAs and CAs is included in the Naming geographic units section of this classification manual. The census metropolitan influenced zone (MIZ) is a concept that geographically differentiates the area of Canada outside census metropolitan areas (CMAs) and census agglomerations (CAs). 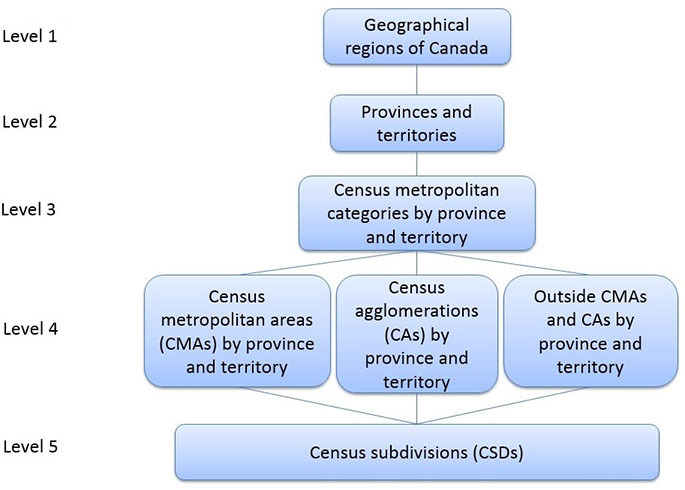 Census subdivisions (CSDs) within provinces that are outside CMAs and CAs are assigned to one of four categories according to the degree of influence (strong, moderate, weak or no influence) that the CMAs or CAs have on them. CSDs within the territories that are outside CAs are assigned to a separate category. A municipality within a province is assigned to a census metropolitan influenced zone (MIZ) category based on the percentage of its employed labour force that commutes to work in one or more of the municipalities (census subdivisions) that are part of the delineation core of a CMA or CA. The calculation of the employed labour force excludes the category of no fixed workplace address CSDs with the same degree of influence tend to be clustered. CSDs with the same degree of influence tend to be clustered. They form zones around CMAs and CAs that progress through the categories from 'strong' to 'no' influence as distance from the CMAs and CAs increases. As many CSDs in the territories are very large and sparsely populated, the commuting flow of the resident employed labour force is unstable. For this reason, CSDs in the territories that are outside CAs are assigned to a separate category that is not based on their commuting flows. Strong metropolitan influenced zone (Canada): This category includes CSDs in provinces where at least 30% of the CSD's resident employed labour force (excluding the category of no fixed workplace address) commute to work in any CMA or CA. It excludes CSDs from the previous census with fewer than 40 persons in their resident employed labour force. Moderate metropolitan influenced zone (Canada): This category includes CSDs in provinces where at least 5% but less than 30% of the CSD's resident employed labour force (excluding the category of no fixed workplace address) commute to work in any CMA or CA. It excludes CSDs from the previous census with fewer than 40 persons in their resident employed labour force. Weak metropolitan influenced zone (Canada): This category includes CSDs in provinces where more than 0% but less than 5% of the CSD's resident employed labour force (excluding the category of no fixed workplace address) commute to work in any CMA or CA. It excludes CSDs from the previous census with fewer than 40 persons in their resident employed labour force. No metropolitan influenced zone (Canada): This category includes CSDs in provinces where none of the CSD's resident employed labour force (excluding the category of no fixed workplace address) commute to work in any CMA or CA. It also includes CSDs from the previous census in provinces with fewer than 40 persons in their resident employed labour force. Territories (outside CAs, Canada): This category includes CSDs in the territories outside CAs. All of the landmass of Canada outside CMAs and CAs are classified by the five MIZ in the classification variant. For example, all areas in Canada with no metropolitan influence are classified as "No metropolitan influenced zone (Canada)". Where "Canada" appears in brackets, it may be omitted when the context provides clarification. In the second level, three-digit numeric codes are used for individual CMAs, CAs and MIZs. The last level consists of the census subdivision codes as described in the classification version. Each census subdivision is part of a CMA, a CA or is categorized as part of a MIZ. This allows for the classification of the census metropolitan categories, the CMAs, CAs and MIZ, by provincial and territorial parts. The hierarchical structure of the classification is shown in Figure 3. An economic region (ER) is a grouping of complete census divisions (with one exception in Ontario) created as a standard geographic unit for analysis of regional economic activity. Such a unit is small enough to permit regional analysis, yet large enough to include enough respondents that, after data are screened for confidentiality, a broad range of statistics can still be released. The regions are based upon work by Camu, Weeks and Sametz in the 1950s. At the outset, boundaries of regions were drawn in such a way that similarities of socio-economic features within regions were maximized while those among regions were minimized. Later, the regions were modified to consist of counties which define the zone of influence of a major urban centre or metropolitan area. Finally, the regions were adjusted to accommodate changes in census division boundaries and to satisfy provincial needs. An ER is a geographic unit, smaller than a province, except in the case of Prince Edward Island and the Territories. The ER is made up by grouping whole census divisions, except for one case in Ontario, where the city of Burlington, a component of Halton (CD 35 24), is excluded from the ER of Toronto (ER 35 30) and is included in the Hamilton–Niagara Peninsula ER (ER 35 50), which encompasses the entire CMA of Hamilton. ERs may be economic, administrative or development regions. Within the province of Quebec, economic regions are designated by law (les régions administratives). In all other provinces, economic regions are created by agreement between Statistics Canada and the provinces concerned. the boundary between South Central (ER 46 20) and North Central (ER 46 40) was affected because Lorne, RM (CSD 46 04 063), Somerset, VL (CSD 46 04 066) and Notre Dame de Lourdes, VL (CSD 46 08 033) were amalgamated to form Lorne, MU (CSD 46 04 064). Census agricultural regions and census consolidated subdivisions are used by the Census of Agriculture for disseminating agricultural statistics. A census agricultural region (CAR) is composed of groups of adjacent census divisions. A census consolidated subdivision (CCS) is a group of adjacent census subdivisions. In Saskatchewan, CARs now respect census division boundaries. There were 72 CARs in 2016. CARs are listed with their component census divisions. For 2016, many smaller 2011 CCSs have been amalgamated in order to create contiguous areas and reduce data suppression. There were 1,768 CCSs in 2016. CCSs are listed with their component census subdivisions. The basic presentation of the classification with tables illustrating the classes is available in Volume I. Maps illustrate the boundaries of individual geographic areas effectively describing the class boundaries of each class in the classification. Maps are included in Volume I and Volume II of the classification. The SGC is the centrepiece of the classification, providing a complete list of its geographic units. These units are the building blocks for all other standard geographic areas. The SGC provides a code, name and type for each census subdivision (CSD). 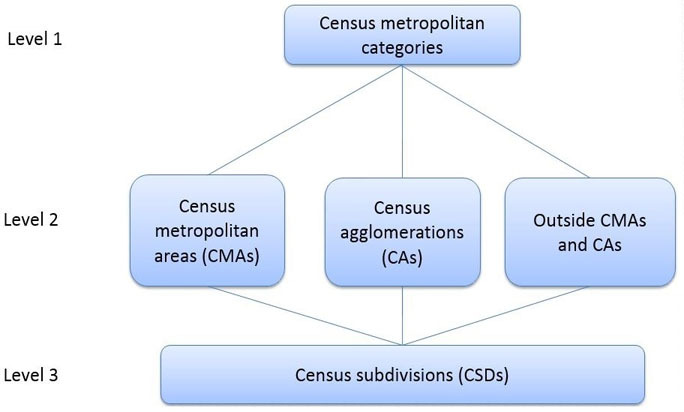 Volume I also describes the classification variants that present census metropolitan areas (CMAs), census agglomerations (CAs), census metropolitan influenced zones (MIZs), economic regions, census agricultural regions and census consolidated subdivisions, and displays them in a variety of configurations for easy access and understanding. The introductory text explains the background and context for using standard geographic units. The metropolitan geography of Canada is recognized in two variants. The first variant, the Statistical Area Classification - Variant of SGC 2016, includes all CMAs, CAs and MIZs within Canada. The second variant, the Statistical Area Classification by Province and Territory - Variant of SGC 2016, shows all CMAs, CAs and MIZs by province and territory and presents the provincial and territorial parts of CMAs, CAs and MIZs that cross provincial or territorial boundaries. These variants of SGC 2016 provide easier access to the census metropolitan categories and to the codes of CMAs, CAs and MIZs for all of the landmass of Canada as well as by province and territory. The variants define CMAs, CAs and MIZs in terms of CSDs. The Economic Regions - Variant of SGC 2016 provides economic region names and codes by province and territory with their component CDs, providing the name and code for each component CD. The Agricultural Regions - Variant of SGC 2016 provides census agricultural region names and codes by province and territory with their component CDs, providing the name and code for each component CD. The variant also provides census consolidated subdivision names and codes by province and territory with their component CSDs, providing the name and code for each component CSD. A list of place names showing alternative place names and repeated place names is included for each census subdivision. Alternative place names include historical names or other languages and alternative spellings of the same name. Repeated place names appear more than once within a province and reflect the fact that a place name has been used for more than one location. Repeated names also appear when a place name is associated with more than one CSD. Three concordance tables present a complete summary of the changes affecting the SGC between January 2, 2011 and January 1, 2016. For that period, they show the changes that impact directly upon the SGC, such as changes in code, name, or type, and indicate how the new and old codes relate to one another. Finally, a table provides 2011 Census population counts based on the census subdivision boundaries of each January and July 1st for census subdivisions affected by a boundary change during the period 2011 to 2016. This product contains a series of 23 maps depicting the boundaries in effect on January 1, 2016 for census divisions, census subdivisions, census metropolitan areas, and census agglomerations. The boundaries are plotted on base maps, showing water features. The maps identify each CSD by name and code, and CDs and CMAs/CAs by code. An index to census division and census subdivision reference maps is also included.